We provide Decal sheets for artists to transfer and fire images onto ceramic surface and glass for interior and exterior application. There is no minimum- you can order one sheet or 100. We do not charge for Color translation. 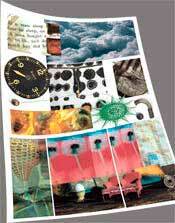 Each decal sheet is comprised of images, photographs, drawings, illustrations- anything you dream up. 1. The file format you send should be a .tif or .psd file. So prepare your file in a software program like PHOTOSHOP. please send only .tifs or psd...use our upload link NOT email. or 15.5 inches x 10 inches, at 300 Resolution, use color mode RGB.At times, receive sheets in CMYK mode. These will be translated as is. Your images will make a more accurate translation IF sent RGB. 3. Place as many images as can fit inside 10 x 15.5 area. Use every bit of it. The back of the decal is what is adhered to the substrate- so for glass typically there is no need to flip your text. 4. Flatten the page into just one layer- background is fine. The background will now be white- since our process does not print white, that background will end up being your substrate- either glass or glazed ceramic. 5. Save as YOUR LAST NAME1.tif ; YOUR LAST NAME2.tif; YOUR LAST NAME3.tif & so on. 6. If you do upload your files from the link below, you will then need to click on ORDER DECALS located at the top of this page so that you can pay with your credit card and pick a shipping option. At the RECEIPT page you will be prompted to UPLOAD your file.....if you have already done so: you must TYPE: ALREADY DID in dialogue box in order to finish up your order. Example of a sheet with multiple images set up. ** IF YOU HAVE SET up your file correctly (300dpi, RGB, size 10x15.5in. and flattened it) the file size should be right around 38 MB. Check this before sending- if it is not - chances are your resolution is too low. This will result in subpar print quality. Though we try our best to contact you, ultimately you are responsible for the quality of files you send us. We encourage you to send a print ready page. For those who are truely computer “challenged” we offer a file set-up service. The minimum charge is $50 for basic page set-up.